With new commer Chef Bayonito running the kitchen, the Corksrew has returned to its initial roots based in a French culinary style, a bit more traditional than nouvelle, which she couples with a folding in of modern approaches, locally grown and organically raised produce with hints of global influences but never enough to move away from its French orientation. 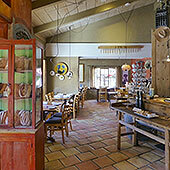 The adorable and charmingly quirky "Corkscrew Cafe" (see videos) in Carmel Valley, California is better than ever with the arrival of their talented new Executive Chef Anna Marie Bayonito (see video interview.). 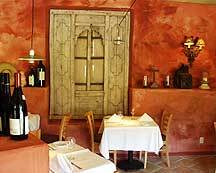 We first visited the cafe with its adjoining Georis Winery ((see video) about 14 years ago when a young Chef Wendy Little from Santa Barbara's San Ysidro Ranch took on the kitchens. We returned in 2006 and the cafe has adjusted its culinary approach with a series of other chefs the current one was excellent if different. Anna Marie's light and creative touch with salads were a knock out! Even with their French base, these salads are driven by decidedly local California ingredients and tastes coupled with those of France. We started with a Caramelized Pear salad with Gorgonzola blue cheese, hazel nuts and a light apple cider vinaigrette that was superb! Peter had her Winter Panzanella Salad of blood oranges, orange oranges, herb goat cheese & croutons, mixed greens and lightly held together by a white Balsamic vinaigrette that was equally excellent. Anna Marie has that hard-to-teach talent of delicately balancing her tastes so that they all work gently and smoothly together. 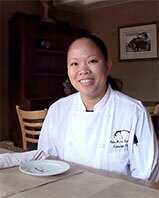 She is a proponent of sustainable seafood, naturally gown meats and poultry. The Monterey Peninsula is also home to some of the best farmers' markets in California - a situation that she takes full advantage of. In addition, the organic Earthbound Farms at the mouth of the valley is just a five minute drive away. Peter and I both chose the Wood Fired Whole Trout. There is something about a whole cooked fish that retains so much more of its taste than a deboned flayed fish. It is worth the time to learn how to find the bones and remove them in order to enjoy this wonderful treat. 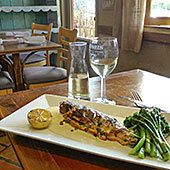 Anne Marie bakes her trout in the wood fired Pizza oven along with half a lemon, then adds a lemon beurre blanc sauce with a few capers (very French), sauteed Fingerling potatoes and steamed broccolini. Visually a simple dish but to the taste buds - heaven. The sauce is light, not heavy, and compliments the trout very well. Made us both very happy. It was served with a very nice Georis Chardonnay (see video on the Georis Tasting Room). "The Corkscrew Cafe" opened in April, 2000 by the Georis family, Walter with his wife Sylvia and brother Gastone Georis, owners of the Georis Winer, who wanted to start a restaurant filled with the atmosphere of rustic south of the border but with cuisine that owes its heritage to Italy and France with plenty of California thrown in. The winery offers 5 glass with Corkscrew baked crusty bread and cheeses tasting "Flight" that can make a light meal in themselves ((see video). The restaurant consists of three dining rooms that offer either small intimate dining or in the large, entry room, a more open space. The two exterior garden terrace dining areas are filled with stone planters, raised beds and a lilly pond with the relaxing sounds of water splashing from the fountain. 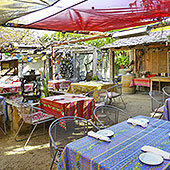 A perfect ambiance to enjoy the simple sensual pleasures of eating good food in fresh air.